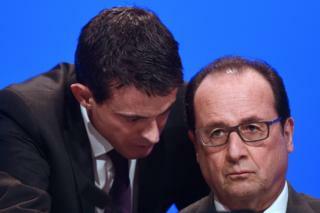 Image caption Could Mr Valls (left) go up against President Hollande (right)? Leading figures in the ruling French Socialists have rushed to avoid a damaging split over their candidate in next year's presidential election. Alarm bells sounded after Prime Minister Manuel Valls suggested he might stand against President Francois Hollande in party primaries. However, the two had lunch together on Monday in a "cordial" atmosphere, Mr Hollande's office said. Francois Fillon was elected as the conservatives' candidate on Sunday. He triumphed at party primaries, winning 66.5% to 33.5% for his run-off rival, Alain Juppe. A new opinion poll suggests he would easily beat the far right's Marine Le Pen in the actual election, held over two weekends in April and May. According to the Harris Interactive poll for French parliamentary TV (in French), Mr Fillon would lead the National Front candidate by 26% to 24% in the first round, then win the run-off against her by 67% to 33%. The same poll indicates that Mr Hollande or Mr Valls would win just 9% for the Socialists, leaving them trailing the far left and the centrists. Who is French presidential candidate Fillon? Mr Valls said on Sunday that he would not rule out running against Mr Hollande in the primary, telling the Journal du Dimanche he wanted to dispel the idea that the left had "no chance" of retaining power. But government spokesman Stephane Le Foll stressed that Mr Valls would need to resign in order to stand. "There will not be a primary between the president and the prime minister," he told Europe 1 radio. At his weekly lunch with the president, Mr Valls apparently played down the idea of resigning, reportedly telling Mr Hollande: "I am head of the government, my instincts lie with the state." The Elysee Palace said the two-hour lunch had taken place in a "quite cordial and businesslike atmosphere". Speaking on French public TV, Socialist party leader Jean-Christophe Camabadelis sought to play down the divisions, saying the left was gripped by "fragmentation fever". "I am for a primary of the whole left, not necessarily of the whole administration," he said. "That's enough fragmentation!" According to the same Harris Interactive opinion poll, while a Socialist would win just 9% in the first round, former Hollande minister and now independent candidate Emmanuel Macron would win 13-14% while the far left's Jean-Luc Melenchon would take 13-15%. On Sunday, Mr Fillon promised his supporters change. "I must now convince the whole country our project is the only one that can lift us up, for jobs, growth and to fight those fanatics that declared war on us," he said. Media captionWho is Francois Fillon? Mr Fillon, 62, had been widely expected to win the race, after securing 44% of the vote just over a week ago in the first round, which saw former President Nicolas Sarkozy knocked out. On foreign policy, he advocates closer relations with Russia. Conservative daily Le Figaro warns Mr Fillon's biggest challenge will now be to stop the "terrible alienation of the ordinary voter", as he will need to appeal to a much broader constituency at the presidential election than in these primaries. Marginalised voters, it argues, are "being driven into the arms of the National Front by unemployment and uncontrolled immigration". The centre-left Le Monde says Mr Fillon's clear victory gives him a "good chance of winning against the National Front and a comatose left". 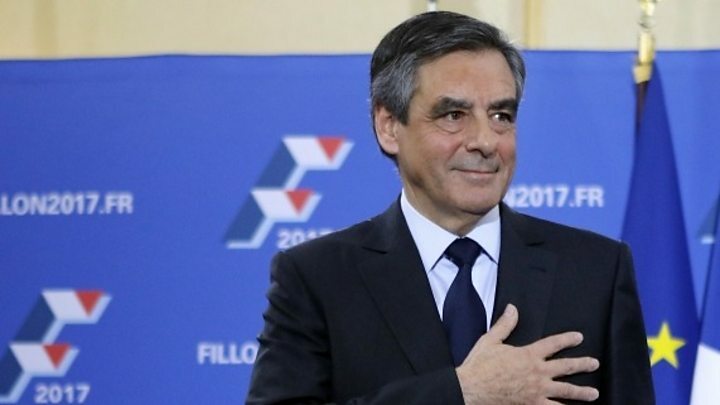 France Info, a popular news website, declares that "'Mister Nobody' is en route for the Elysee Palace", adding that "it must be said that Francois Fillon has come a long way". Just how radical is Fillon?